Bubble Wand confiscation began in earnest today by local authorities. They're acting on orders of the Feds. Door to door, house to house. If they find the kids hiding them, under the bed or with their dollies, immediate arrest and mandatory 18-month sentence. You think your daughter's tears slow down these thugs? Most of these guys just got done doing the same thing in Iraq, back to back tours. You know what comes after this: Patriot Re-Education Camps. And you were silent. 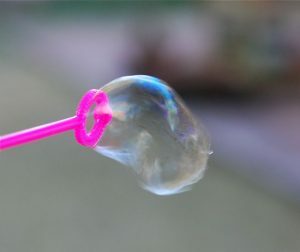 Bubble Wand confiscation began in earnest today by local authorities. They’re acting on orders of the Feds. Door to door, house to house. If they find the kids hiding them, under the bed or with their dollies, immediate arrest and mandatory 18-month sentence. You think your daughter’s tears slow down these thugs? Most of these guys just got done doing the same thing in Iraq, back to back tours. You know what comes after this: Patriot Re-Education Camps. And you were silent.